The Moon is by far the most detailed astronomical object to observe through a telescope and the comprehensive Isabel Williamson Lunar Observing Program (IWLOP) will guide you through a complete tour of our nearest neighbour's incredible surface. The program includes many outstanding craters, mountains, valleys, scarps, ridges, and more, not only showing you how they appear, but also describing the history of their formation over four billion years. 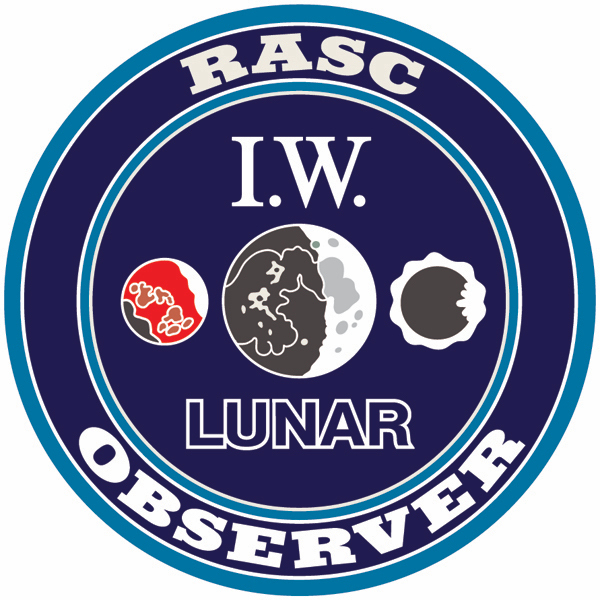 The RASC Observing Committee created the IWLOP in 2006 as a certificate program for intermediate observers; since then, 18+ RASC members have earned their IWLOP certificates and many have provided constructive comments, leading to several minor revisions and corrections in 2013 and 2015. The IWLOP is an educational experience, including a detailed guide with key information about the lunar surface and how to observe it. The guide begins with an overview that outlines the required objectives for earning the certificate, and includes extra optional activities such as challenge objectives, lunar sketching, lunar astrophotography, craters with Canadian connections, and the Lunar 1000 Challenge. A detailed history of the Moon follows, including the various eras that have shaped its surface. Several types of lunar surface feature is described, along with their unique observable characteristics. The Foreword by David Levy is a testimonial to Isabel Williamson herself, a mentor to David and many other RASC observers, and for whom the program is named. RASC members who have have completed the required objectives of the IWLOP may apply for a certificate and pin as follows: Download and complete the PDF application form below. Extra distinction can be earned for obseving at least 100 challenge objects. Present your application and observing records to your Centre Executive for validation. Two executive signatures are required on the application form, which should then be sent to the Observing Chair. Alternatively, any member (especially an Unattached Member) may send an application and a suitable copy of observing records directly to the Observing Chair (by arrangement, files maybe sent electronically in a mutually agreeable format). Sending an original logbook is acceptable, at the applicant's risk, but not recommended! Charles Woods' The Modern Moon: A Personal View is an excellent resource for the certificate. Find out details about the Isabel Williamson Lunar Observing program here.